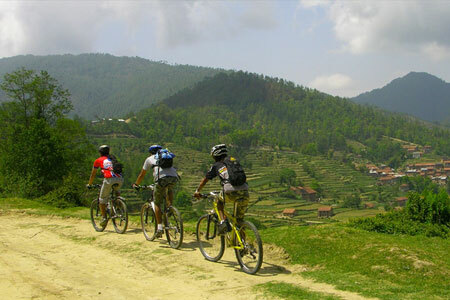 Round Annapurna Mountain Biking TourRound Annapurna biking tour is one of the most popular adventure activities in the trail which is best known for having panoramic views Himalayas, including the Mt. Dhaulagiri 8167m, Mt. Annapurna I (8091m), Mt. Manaslu (8163), Mt. Annapurna II (7937m) , Mt. Annapurna III(7555m), Mt. Annapurna IV (7525m), Mt. Annapurna south (7219m), Mt. Nilgiri (7041m), Mt. Fishtail also called Machhapuchhare (6998m) , Mt. Hiunchuli (6441m), Mt. Lamjung Himal (6986m),Tukuche peak (6920m), Tilicho peak (7134m) among others. The mountain biking is in the areas is explore the diverse culture and lifestyle of people living in the areas and the flora and faunas lying as a living museum. Since the Manang was opened for trekkers in 1980s, the trekking in the area has become a center of attraction for many tourists, as the region is rich in breathtaking scenes. Day 06: To Lower Pisang village (15.2km, 600hm, 3260m, 80% ride-able). The biking is easier today, following a trail beside the Marsyangdi River which goes through pine forest with views of the Annapurna Himal. We still need to push the bikes as we approach the Wave Rock, a huge rock weathered to look like a wave. Beyond it the going is easier along a lovely trail through pine forests. At Lower Pisang there are lodges and after a rest, and some tea or coffee, we can visit Upper Pisang which has a 15th century Monastery and amazing views of the Annapurna range and Pisang Peak. Day 07: To Manang village (16.7km, 400hm, 3450m, 95% ride-able). A mostly flat trail, with more fine views of the Annapurna range and Pisang Peak. Day 08: Today we rest at Manang to acclimatise, enjoying the village and perhaps visitng an old Monastery. Day 09: To Thorong Base Camp (18km, 910hm, 4450m, 70% ride-able). The trail goes steeply up to Tanky, but is then more ride-able, though it still rises continuously. Day 10: Today we cross the Thorong La, at 5416m, to reach Muktinath (21km, 966hm, 3800m, 60% ride-able). This is the hard day, with a long uphill climb to a high altitude pass. We start early becausethere is usually a strong wind blowing across the pass after 11am. Mostly we have to push the bikes to reach the pass, but then there is an amazing downhill ride to Muktinath, where there is a very important Hindu temple with 108 fountains. Thousands of pilgrims come here at festival time. 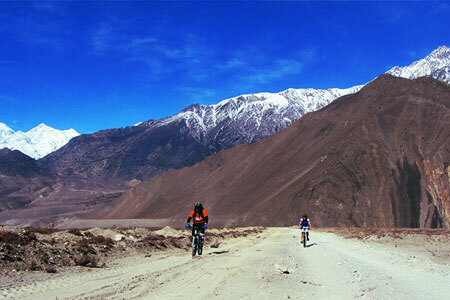 Day 11: To Jomsom (25km, 2750m, 98% ride-able). Today the entire ride is downhill and it is also not very technical, so it is a very pleasant day, and one with superb views of Dhaulagiri, at 8167m the seventh highest mountain in the world. The area we ride through is also very beautiful, and there are typical Nepalese villages - Jarkot and Kagbeni. Kagbeni is one of Nepal's most beautiful villages, and has a 15th century Monastery (Kagchode Gompa). The day's trail finishes by following the Kali Gandaki River to Jomsom. It is easy going, but we need to be prepared for a section notorious for strong winds between Kagbeni and Jomsom. 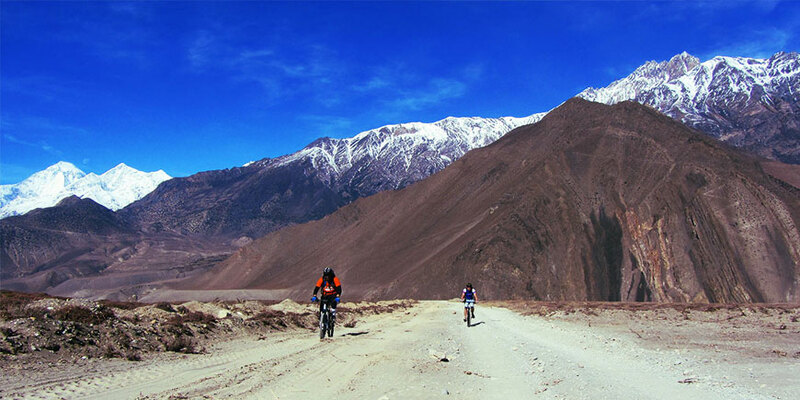 Jomsom is the headquarters of the Mustang District and has hotels, shops and offices as well as an airport. Day 12: To Kalopani (24.8km, 2530m, 85% ride-able). At first we follow the Kali Gandaki river through the villages of Thakali, Marpha, Tukuche and Larjung. The next section is easy riding, following a jeep track to Kalopani, a beautiful village set below the Dhaulagiri Himal. From the village there is a panoramic view of Dhaulagiri, the Nilgiri peaks and Annapurna I. Day 13: To Tatopani, (23km, 1190m, 75% ride-able). Downhill at first, then a technical section where we cross a suspension bridge and ride through pine forest to reach Ghasa where there are severallodges. From here the trail goes steeply down to the Rupse waterfall, one of the biggest on the route, where we have lunch at a restaurant with a fine view of the falls. Beyond, the trail is much easier, going through Dana village and crossing rice paddies to reach Tatopani, a small town on the north bank of Kali Gandaki River. This is a great place to stay as there are hot springs and cold beer. Day 14: To Beni Baazar (24km, 830m, 90% ride-able). The trail follows the Kali Gandaki River through the world's deepest gorge to reach Beni. This is a fun day, with an excellent trail and a section of new road. Beni is the headquarters of Parbat District and has many shops and hotels. From here we take a bus for the 78km to Pokhara. Day 15: A free day top explore fascinating Pokhara. We could even explore it by bike. Day 16: We take the bus for the 200km drive to Kathmandu. Overnight at a hotel. Day 18: Departure for home.